I’ve traveled to every corner of Pennsylvania to listen to you and your neighbors about how state government can get back on track and make real progress for working class families. I have heard your voices loud and clear: We need to reform state government, make schools better for our kids, and create good-paying jobs that support our families. We’re all tired of Harrisburg ignoring the working and middle class —which is why I’ve fought to increase wages and make investments in programs and projects that will create good, family-sustaining jobs. I’ve secured an additional $640 million in funding for education to restore the cuts made in the previous administration and implemented a fair funding formula to make sure all of our children are getting the education they deserve, no matter what their zip code is. I’ve also expanded health care access for nearly 700,000 Pennsylvanians and secured funding and bipartisan legislative reforms to fight the opioid and heroin crisis. We’ve legalized medical marijuana and ride-sharing across Pennsylvania. We’ve reformed our liquor system for the first time since Prohibition – making wine available in your grocery stores and six-packs available at your local gas station to increase customer convenience. 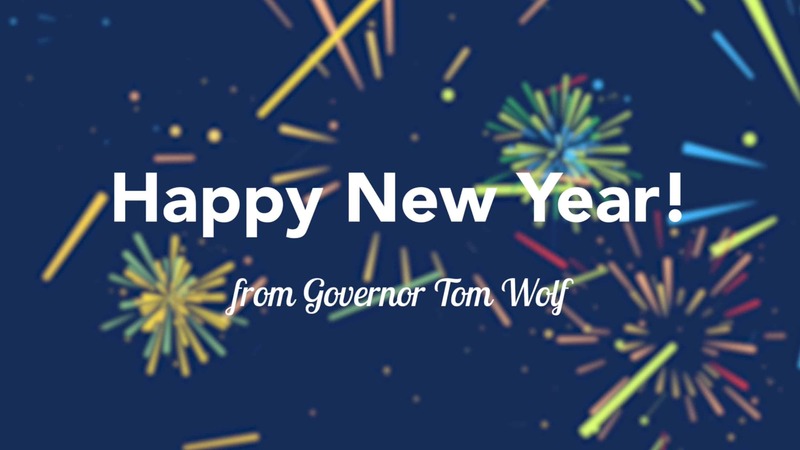 So today, I’d like to wish all Pennsylvanians a very happy New Year’s Day and let you know that in 2017 and beyond, you can count on me to fight for you.